EDITOR’S NOTE: This guest post and photos appear courtesy of Duncan McDonell, a sophomore at Stuart Hall High School in San Francisco. His school of one of 22 that belong to the Sacred Heart Network of schools in the United States. 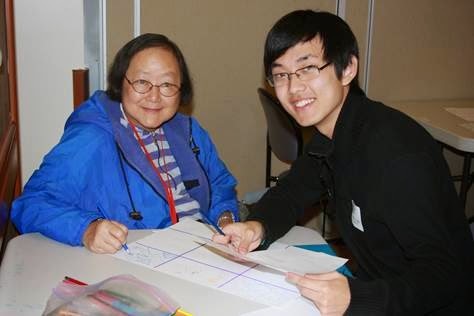 In my first blog post here, “Art as a Tool for Intergenerational Connection,” I talked about my work with older adults at the Institute on Aging (IOA), thanks to the Youth Jumpstart Grant from Generations United and Mentor Up. That’s how I met Jessica McCracken, my mentor and program manager of IOA’s intergenerational arts program, Center for Elders and Youth in the Arts (CEYA). At IOA, Jessica and I teach art in the day centers. 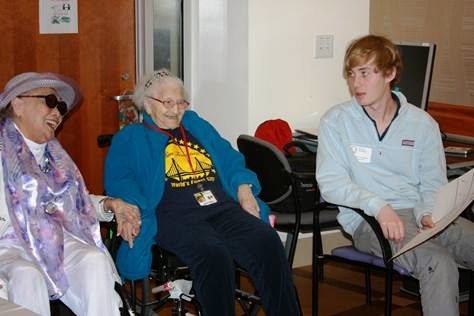 Part of my goal for the Youth Jumpstart Grant was to expand IOA’s intergenerational arts programs with help from my high school’s Students in Action (SIA) team, of which I’m a member. This program is part of our Service Learning Program directed by Raymond O’Connor, who is a great man and has helped me with my project tremendously. In SIA, we organize community service activities, present monthly service awards to members of our community, fundraise, and promote service learning throughout our school. The whole SIA program is amazing. I’m honored to be a part of it. This year, the SIA team headed our school service day, the day our entire school (and affiliated junior high school) break into groups and travel around the Bay Area to provide community service. While brainstorming where to host some of our service sites, I suggested Institute on Aging, an idea the SIA group strongly supported. They chose me to lead our project. Before our March 14, 2014 school-wide Service Day, Jessica and I felt the need to provide sensitivity training to my peers at Stuart Hall High School before they came to teach. We met with seven students for an hour at school and, using a presentation Jessie and I made, we discussed various strategies for how to make the seniors’ and the students’ experiences as meaningful as possible. Jessie talked about IOA and its 24 programs that enhance the quality of life for older adults. She also discussed age-related changes and the particulars of working with a frail older population, and I added tips that I picked up from my experiences. My main tips were never judge anyone, especially elders, by first impressions and don’t be afraid to interact with the seniors or engage them in conversation. After our sensitivity training, which went very well, we were ready to teach. Our group was comprised of five high schoolers and two junior high kids. Everyone that went was passionate about art and enthusiastic about interacting with elders, as they were allowed to choose their service day elective. At IOA, we paired each youth with seven elders and worked on a drawing-interview activity, in which we filled boxes with drawings of each of their favorite things (e.g., food, animals, places). The students then stood at the front of the room as they presented their project and told us about themselves and their partner elder. It was an excellent activity in my opinion because it helped us all learn about each other and our interests. All the seniors loved the class and so did the students. One of my peers even told Jessie and me that “serving the seniors really made me feel like I was making someone’s life a little better, something I aspire to do in the future”. I’m so glad we were able to not only help the seniors have a good time, but the kids as well. Throughout the course of this wonderful day, Jessica and I were able to expand and improve IOA’s arts program. Not to mention, we enjoyed it as well! What a wonderful project! 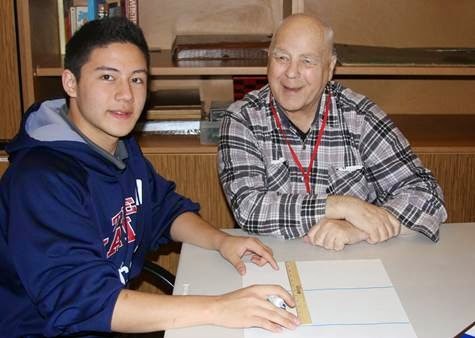 I plan to share this story with the teens at the Hudson River Museum that received funding through the same program to provide museum tours and hands-on projects to two senior centers. Sounds like this project made a real difference for all ages involved! Thanks, Duncan! You're an amazing person and we're delighted to have you Stuart Hall High School. Keep up the great service. Thanks, Katie! Please do share and keep us posted on any ideas the teens at the Hudson River Museum come up with. Ray, Duncan is doing some amazing work! I'm sure he appreciates your guidance. Grandparents Day Blog: "I Love You"